A king who was a learned man in the vedas used to take care of his subjects very well to the like of his people.He had everything he wanted but had three questions bothering him for a long time for which he was looking for answers,he visited many places met many scholars to find answers to these questions.One day he decided to asssign this task to a scholar who was a very learned man in literature and philosophy.He summoned the scholar and gave him the following questions. Which way is he seeing? in praise of god. This young boy saw his master worried and decided would go help him out, but although the master was a learned man he was arrogant and egoistic to share his problem with a 12 year old but finally decided he would tell him.Once the boy heard the problem he assured his master to be at ease and relax for the rest of the time and to give him a note when it is time to see the king that he is sick and chose the boy as his representative to give the answers. Time passed by and the day finally arrived, the king was very excited to learn the answers, he summoned all the neighbouring kings and gathered a great audience to witness this event.The crowd was waiting anxiously to see the great scholar but he didnt show up instead they saw a young boy walk towards the king and give him a note.The king read the note and felt it was appropritate to let the boy answer the questions as the scholar himself had requested for it and so asks the boy for the answers. The boy with a smile replies back that since he will be giving him the answers and explaining these adhyatamic queries he gets the status of the teacher and that he needs to be seated on his throne while the king stands with his hands folded like an obedient student. On listening to this the king is confused and after discussing with his ministers he decides to do so as it is appropriate for the guru to be seated comfortably.The king steps down and lets the boy take the throne. The king asks out loud “Where is God”, in response the boy requests for a jug of milk and asks the king if there is butter in the milk, the king replies that the milk has to ferment and churned later to separate the butter from it.The boy replies just this way God is there in the entire universe and he who practices and spends time in searching him will be sucessfull in seeing him but the persistence and the devotion are required just as extracting butter from milk.The audience is elated listening to this answer which was based on a simple comparison. The next question was asked “Which way is he seeing?” The boy shows towards an oil lamp and asks the king which direction the flame is pointed at.Suprised ,the king replies its not pointed at any direction but the whole room is illuminated.The boy explains just the way the suns light is spread thourghtout the universe Gods reach is spread throughout which includes the human mind as well and so its best to keep the mind open to feel god within. “What is his work?”.The boy replied he brought me a simple cow herd to sit on this lavish throne in comfort and took you the king of kings down to stand infront me with your hands folded, that is the kind of work he does, whenever and whereever a decline of righteousness and predominance of unrighteousness prevails at that time I manifest myself personally. The above story is an excerpt from the Vigyana Yoga(chapter 7) ,Bhagavad Gita as narrated by Sri Vidya Prakasanandagiri Swami .In chapter seven Lord Krishna gives concrete knowledge of the absolute reality as well as the opulence of divinity. He describes His illusory energy in the material existence called Maya and declares how extremely difficult it is to surmount it. He also describes the four types of people attracted to divinity and the four types of people who are opposed to divinty. In conclusion He reveals that one in spiritual intelligence takes exclusive refuge of the Lord without reservation in devotional service. 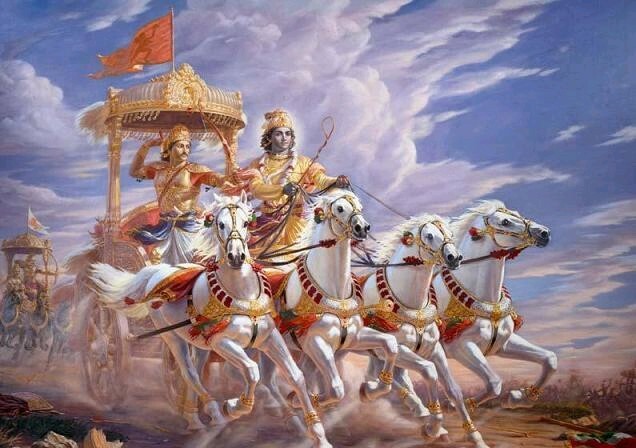 Very nice, brief and to the point explanation of every verse.I listen to the Bhagavad Gita rendered by Sri Vidyabhushna and together with the PDF of the Gita from this site the learning experience will be just wonderful. Thank you.